This is a unique, activity-driven sequence of exercises that guides new composers through the principles of Melody, Counterpoint, Harmony, Form and Invention. Through these composers build a foundation of technique that will support them later on in their new directions. After completing the one-semester sequence, each composer will have four compositions to add to their portfolio: a CANON, a CHORALE, a piece in BINARY FORM, and an INVENTION. 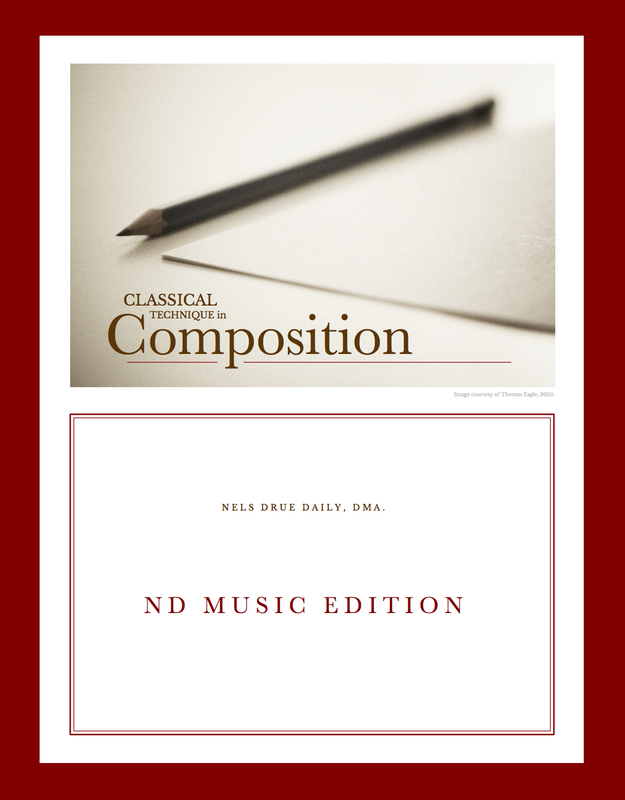 Classical Technique in Composition is a text of exercises to be used in individual or classroom instruction. These exercises assume a previous study and understanding of music theory. Two semesters of music theory, or a study of roman numeral analysis, 4-part voice leading, and modulation are requisite to complete this course. This edition was engraved in LilyPond 2.17.97 by Nels Drue Daily, and is available for purchase from Lulu Publishing. This entry was posted in Editions and tagged beginners, composition, technique. Bookmark the permalink.